SMA male to SMA female 90' adaptor suitable for linking your PCB to your antenna or mounting amps to cases. Useful for when your board is mounted horizontally and your antenna needs to be vertically down. There is a SMA Male connector at one end and a female at the other. 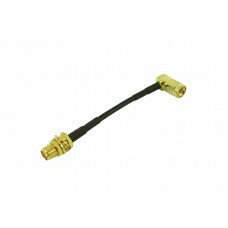 The 3 cms long cable is RG174 with a 90' SMA Female and short panel mount SMA Male. The 15 cms long cable is RG316 with a 90' SMA Femail and long panel mount SMA Male. Uputronics filtered preamps for improved 868MHz Reception for FLARM/LoRa/ISM (reception NOT transmis..
Uputronics filtered preamps for improved HAB reception on 434MHz. This is a cost effective SAW bas..
Uputronics filtered preamp for improved Radiosonde/403MHz Reception This is a SA..
Uputronics filtered preamps for improved UAT/978MHz Reception. This is a cost effect..
Uputronics filtered preamps for improved reception on 145MHz. This is a cost e..
Uputronics filtered preamps for improved reception on 161MHz/AIS frequencies.Thi..
Uputronics filtered preamps for improved reception on 137.5MHz. This is a cost ..